Chocolate sales have long been noted to hold up in a recession, supposedly because people turn from big ticket purchases to little treats to cheer themselves up. An article in Time magazine indicates this is a ‘sweet spot’ even now, with the chocolate sector resilient and major brands like Nestle, Lindt and Cadbury predicting growth for the year. This year many manufacturers made a concerted effort to reduce the environmental impact of this growth by reducing the packaging on Easter themed chocolate confectionery in the UK. This can be multilayered card and plastic to protect the delicate mouldings of eggs and bunnies. 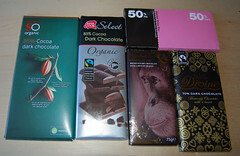 It is estimated that packaging has been reduced by an average of 25 per cent. In the shops I saw Easter chocolate in every kind of shape from shoes to motorbikes to landmark buildings like Big Ben in London. Bars of chocolate are cheaper weight for weight, as you don’t pay for so much packaging or for a load of air inside hollow shapes. Another tip for the cash strapped in the UK is to try cooking chocolate, which is VAT (Value Added Tax) free, unlike chocolate that is marketed as confectionery and has 15 per cent VAT slapped on. Cooking chocolate looks less fancy as it comes in functional chunky blocks. Although it may not look as luxurious it often has smoother and creamier texture. Frequently it contains a higher proportion of cocoa butter than confectionery chocolate, so it can easily be melted and made into shapes or spread on cakes.